A varied walk from Cotherstone visiting the wooded banks of the River Balder before climbing up on to the moor to Goldsborough before returning via Loups’s Hill and Currack Rigg. Due to a combination of bad weather and low spirits it had been a few weeks since I’d last got out for a walk – most unlike me. When the forecast for the approaching weekend was also poor it looked like I wouldn’t be going out again. However, with Friday’s forecast looking good I took the day off and, on the Friday morning itself, decided to do this walk. Prior to this walk I hadn’t visited Teesdale for over a year and a half. The impetus for going to the North Pennines on this occasion was this website. Much delayed I’d finally begun working on it over the previous few weeks. It made sense therefore to get a ‘new’ walk to add to it. Having parked on the roadside opposite Cotherstone’s village green I walked north through the village before dropping down to Balder Bridge. For fans of the Ordnance Survey there is a cut benchmark on the left hand side of the bridge as you cross. On the other side of the bridge I followed a sign into the field on my left. Before following the grassy path up to a wooded bank I first went to look at the ruins of an old mill. Just below the mill was a nice little waterfall on the River Balder. Back on the path I climbed up the wooded bank up towards the house at Doe Park. There followed a pleasant walk initially through and then on the outside of Balder Bank Woods. Shortly after the impressive Balder Viaduct came into view I crossed the old Teesdale railway line. A brief detour left on to the viaduct brought into view a grand view upstream with Goldsborough in the distance. Back on the path it soon dropped down to the river itself. Crossing over a footbridge a steep pull on the other side brought me up alongside Osmond Beck. Reaching a country road, Briscoe Lane, I turned right to head west for a good half mile or so. After passing the houses at Briscoe Gate and Briscoe Farm I took an access road to the left. Almost immediately I came to another fork. My route was to the right but it is worth noting on the left hand side the ruins of Freewill House. Just across How Beck a new looking information plaque provided some interesting information on the house. Continuing on I passed the house at Trees to reach the road end at Fiddler House. From Fiddler House a number of paths set off across Cotherstone Moor with Goldsborough looking very inviting indeed. I chose the path closest to How Beck, this soon crossed the stream at a footbridge. Continuing on a faint bridleway on the other side of the beck the views extended out to include Shacklesborough and, even further away, Little Fell and Mickle Fell. Eventually I arrived at a gate on my left where a bridleway enters the Battlehill Range. I would return to this point and for those who may want to omit Goldsborough and West Hare Crag the walk can be shortened a few miles by turning left at this point. To reach Goldsborough I continued on, soon losing the faint path. It was not far though to reach the Bowes Loop section of the Pennine Way. Once on this I turned right and followed it over a couple of footbridges to reach the fine gristone crags of Goldsborough. After exploring the larger crags I walked over to the northern side of the summit area to look down at the chain of reservoirs in Baldersdale. The all round views were superb, my only disappointment being that the skies had clouded over. Dropping down from Goldsborough I made my way across pathless moor, initially heading for Catty Crag Quarry. This could be easily seen and was reached after crossing Yaw Sike. The quarry must be quite old as there are no obvious paths leading to it. Not far above the quarry I reached the trig point on Brown Rigg. 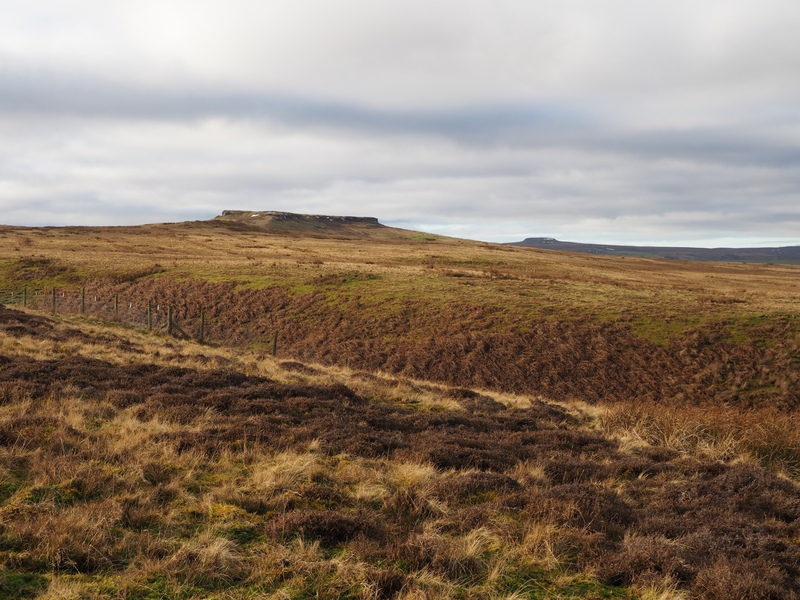 Sat on a modest little gritstone crag called West Hare Crag the view from the trig point was quite extensive – to the east it extended as far as the Cleveland Hills. From the trig point I walked east to pick up a thin path near the wall. This led me up on to East Hare Crag where a tall boundary stone was found alongside the wall. Carrying on I basically followed the wall east, then north, to finally reach the gate again. Apparently sometimes the firing range is still used, fortunately it wasn’t on this occasion! Passing through the gate a superb path passed over Loups’s Hill. I didn’t find any but there are apparently some cup and ring marked stones to be found in this area. At the eastern end of the hill I passed the sad looking ruins of East Loups’s. I can never pass old farmhouses like this without stopping and trying to imagine what it must have been like in its heyday. Below East Loups’s a good track left the firing range to strike out across Currack Rigg. If you are not a trig point enthusiast I’d recommend staying on this track all the way to the road. However, as I’d not previously bagged this particular trig point I soon left the track to try and trace a very faint path across the moor. When I did finally reach the trig point it was to find a long blue hose pipe wrapped around it! A bit of sunshine would have made the scene much more appealing but instead I found it really quite dreary. Continuing in a north-east direction I finally reached a bridleway. Turning right on this the going was much easier. Just before reaching the road a thinner path branched off to the left to visit a quite innocuous looking rock. Marked as ‘Butter Stone’ on the map it is apparently a 17th century plague stone. According to the Megalithic Portal website it was used as a market point during the Great Plague of 1636. An old penny can be found glued into a hole on the top of the stone. Once on the road it was a simple walk back into Cotherstone. While it is possible to stay on the roadside all the way I varied it a bit by taking a path just before a cattle grid. This passed the interesting garden of Pinners Cottage to descend through fields. After crossing once again the old railway line I finally re-entered Cotherstone near the church.